I have to be honest I was very annoyed and surprised to see this. Tesco’s is generally not a good name to bandy about in the independent world of business. There is much resentment amongst independent businesses about the way large supermarkets have worked hard to wipe out independents. As soon as an announcement is made that they have applied for planning permission communities do go up in arms to save their local economy. The debate goes on forever. Tesco’s do seem to have the least favoured name in the game! I will hold my hand up. I do shop in large supermarkets – I have a Tesco’s near me which I regularly visit as it is very convenient. I wish I didn’t have to and try and avoid this, but I have a lack of choices when it comes to buying some goods. This choice will be further diminished if more independent business loose the battle for survival. When I do support local businesses, I feel fabulous. Whether it is a local florist, a local farm shop or a small independent dress shop, I feel that I have done something (however small) to support my local economy. I value the customer service, the skill, time and effort that has been put into the business to provide me with the service that I am paying for. I make the choice with my eyes wide open as to which business I am supporting. I guess that is what I am so annoyed about. Every independent business I know has hours and hours of toil behind it. It takes years to build good strong relationships with customers and we all endeavour to go that extra mile for our customers. How annoying then that a large multinational company should try and emulate this … but by not being open about the fact that they are a chain with vast resources. They are trying to jump on the bandwagon of the fight for survival for the small businesses – by trying to take their customers! I wonder if someone in the boardroom flippantly said “if you can’t beat them, join them” when their profits were down last year. This has made me more determined to avoid them and to ensure that I spend my money with local businesses. Businesses where I know people care and have worked endless hours to give me the product and services that I wish for. There is a magic in visiting a local business. The owners take pride in what they do and what they have achieved so far. The hard work is evident in their product. There is a special atmosphere and I truly wish good luck to every real artisan and independent business out there! I love this quote. For me it shows what Valentine’s Day is all about. Many people seem to find Valentine’s Day a stressful time. Quite often couples agree not to do much on Valentine’s. Men are then baffled when their partner presents them with a gift on the day with an expectant look on their face. There is then a sudden panic as one tries to arrange an amazing experience for their partner that they can present them with as a surprise on Valentine’s Evening. We have often been called in to save the day last minute! From a female perspective I would say it is not about the gift itself. Obviously there is a certain standard that the gift should pass. It is more about the gesture. It is about the thought and effort that has gone in to the gift. It is about feeling valued, and knowing that you weren’t an afterthought on the way home from work. It is about the delight you feel when you go through the mechanics of untying the ribbon, opening the box and finding a little treat just for you. Plan ahead – look around you. When you start to see pink and red in the shop windows with lots of hearts everywhere it is time to think about what you would like to do for Valentines. The date does not change – it is always on 14th February. Keep it a surprise – most people love surprises! Consider the recipient – think about what your Valentine really likes. 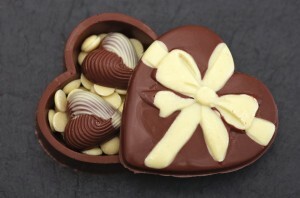 Find out if they prefer milk or dark chocolate before buying that box of chocolates! Wrap it – even if it is in a ready-made gift bag.